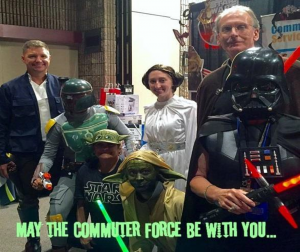 Program: May the Commuter Force Be With You! This award is given to recognize excellence in Florida public transportation-related marketing including, but not limited to the following: advertising campaigns, electronic media, print media and special events. District 1 launched the “Commuter Star Wars” Campaign to excite employees, attract attention, gain interest, and generate action to enroll in the program and learn more about alternative modes of transportation. For example, during the three-day outreach recruitment, they were able to develop a customized theme that brought commuters to their outreach tables. They looked for every opportunity to engage and bring excitement to the program with creative marketing. The goal was to rejuvenate the program at Sarasota Memorial Hospital and make it fun and interactive for commuters to participate. They created a challenge for each Sarasota Memorial department to register the most fellow employees in Commuter Services to win the Commuter Galaxy Award! They worked collaboratively with the Human Resources, Management, Security, Transit, Parking Planning and the Healthy Initiatives Team as well as local government and transportation partners. All the volunteers purchased their own costumes and decorated their tables and local organizations donated prizes and giveaways in the amount of $300.00. No marketing dollars were used by the Commuter Services Program. The Commuter Program initially had 120 registered hospital employees. At the end of the Star Wars Campaign, over 800 employees registered with Commuter Services, 460 take bus shuttles to the registered park and ride locations, 30 carpool spaces have been assigned, two hospital employees were designated to the new emergency ride home program, a new employee bike program was established and transit services routes to the hospital has tripled. This award is given to honor a Florida individual who has made outstanding contributions to the public transportation industry. This award may be conferred upon a public transportation policy maker or private citizen who has made outstanding contributions at the local or state level to public transportation. 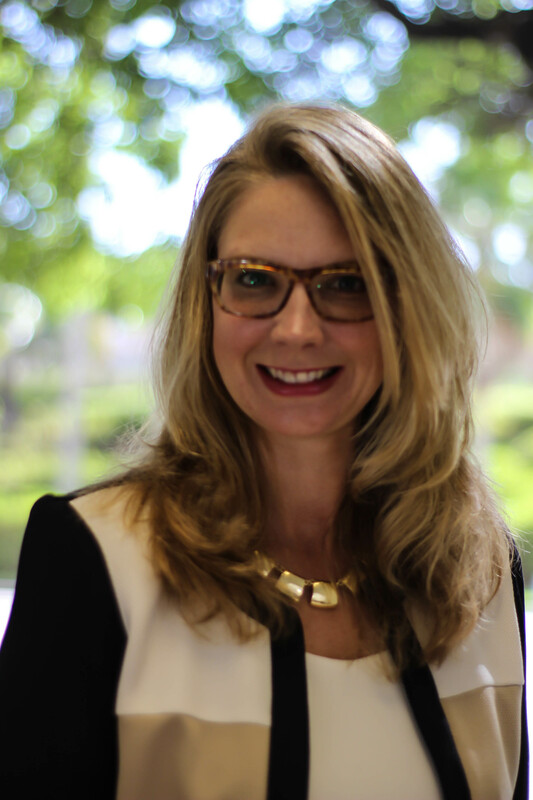 Within Florida, Danielle has been involved with contentious traffic impact studies, roundabout feasibility and designs, traffic signal design and retiming. Served as the Lighting Project Manager and design engineer for the award winning City of Miami Beach West Avenue Neighborhood Improvement project. Through her involvement as the technical lead on the Active Living Committee for Walk-Bike Tampa, Ms. Joyce prepared the City of Tampa Open Streets Strategic Plan. 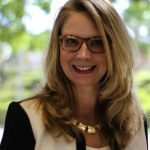 Her current work involves managing the Dale Mabry Pedestrian Overpass Technical Feasibility Analysis for the Hillsborough County MPO. When completed, this project will provide safer, multi-modal options and regional trail connectivity. Ms. Joyce is also working on a Transit Bus Stop relocation project for Hernando County, and traffic signal design for I-95 in Pensacola. She is very passionate about safety and currently serves on the Community Traffic Safety Team and the Bike/Walk Tampa Bay Coalition and is the Executive Board Vice President of Tampa Bay ITE. This award is given to a Florida public transportation system, commuter assistance program, transportation management organization or other Florida entity that has designed and implemented specific public transportation-related programs that demonstrate innovative concepts or effective problem-solving techniques. The program should be of proven value and adaptable for use by others. 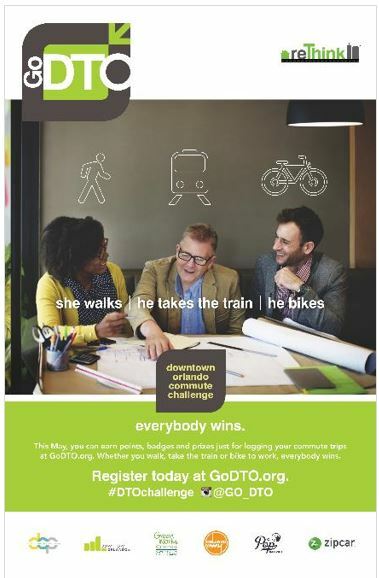 In May 2016, Downtown Orlando commuters earned points, badges and prizes for logging their trips at GoDTO.org. The initiative, called Go DTO, was a commute challenge for people who commute to worksites within the Downtown Orlando Community Redevelopment Agency area. This was a collaborative effort between many partners including rethink Your Commute, the Florida Department of Transportation’s District 5 Regional Commuter Assistance Program, and the City of Orlando’s Downtown Development Board, GreenWorks Orlando, the Downtown Orlando Partnership, Orlando Weekly, The Pop Parlour, and Zipcar. Goals included to make alternative transportation and the Regional Commuter Assistance Program “top of mind” among Downtown Orlando employers and commuters to identify new employer partners, to provide new commuter programming and benefits to existing employer partners and to provide direct commuter assistance to anyone commuting into Downtown Orlando. The promotion included education, informational promo items, special events and outreach to existing employer partners and property managers.